and relatively undifferentiated, whereas those in the distal portion are irregularly forked and give off second-order branches. Branch tips may be fringed. 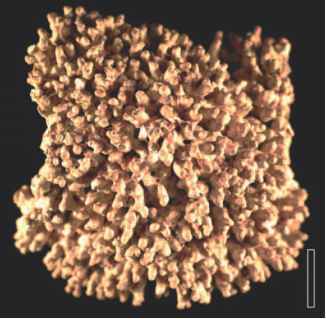 The most similar modern red alga is perhaps the gametophytic thallus of Sphaerococcus coronopifolius (Gigartinales). Various morphotypes believed to represent uncalcified red algae have been reported from middle and upper Miocene rocks from the Monterey Formation in California (Parker and Dawson, 1965). In general, they consist of planated axes with equally spaced laterals.